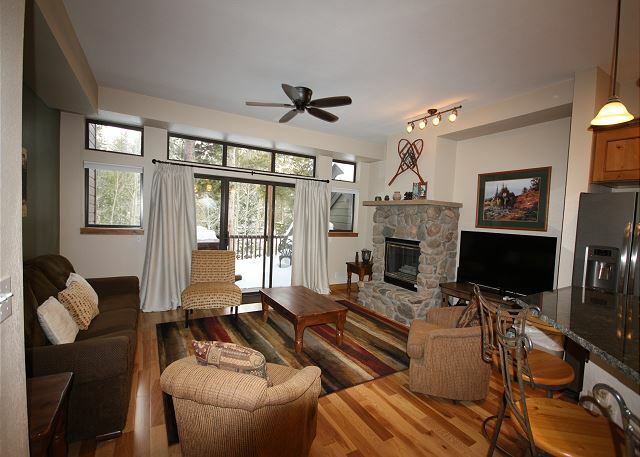 This nicely decorated and recently updated, three bedroom, three bath town home is the ideal mountain retreat for a gathering of family and friends. The open and spacious main level is comprised of the living room with a gas fireplace, dining room and kitchen. 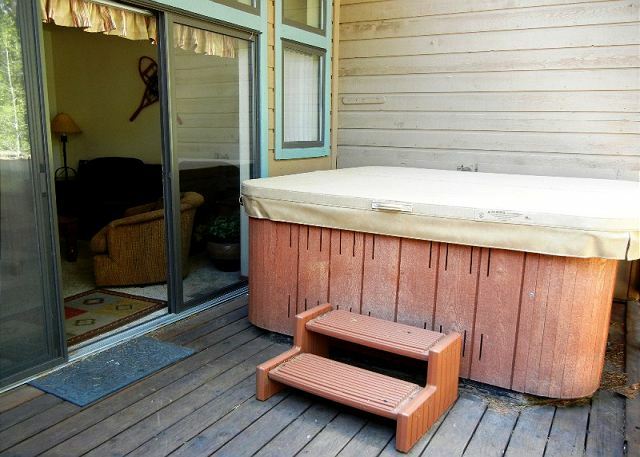 There is also a large, private deck that has a new 5 person hot tub! The unit features a large dining room with seating for six and breakfast bar with additional seating for 4. 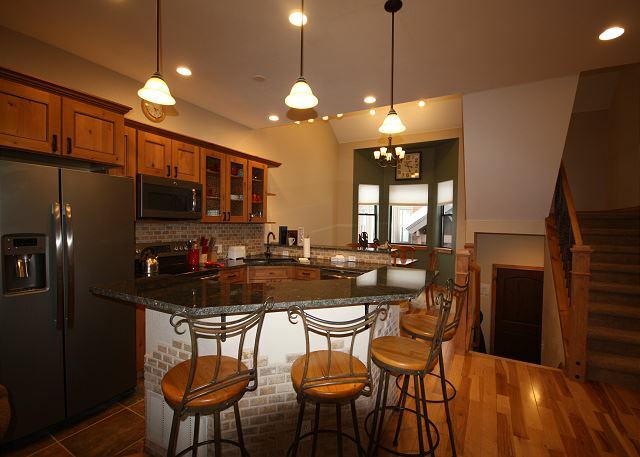 The kitchen offers plenty of counter space and the open design is perfect for entertaining guests and family gatherings. 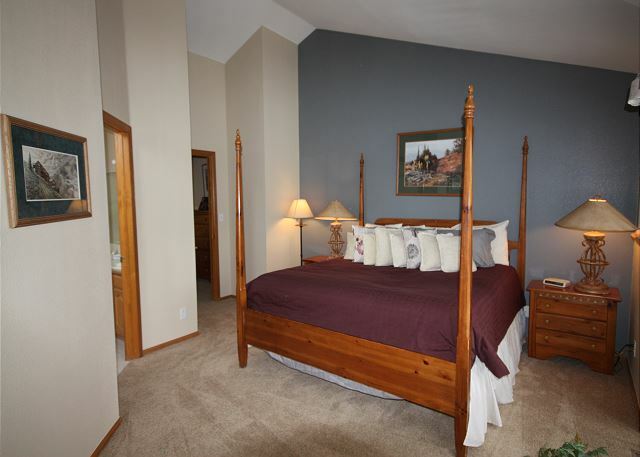 The upstairs features a large master suite with a 4 poster bed, own master bath, and private balcony. The lower lever has two bedrooms, one with a set of twin beds & full bath and the 2nd bedroom has a queen & full bath. There is also a washer dryer and a queen sleeper sofa in the living room. The town home is conveniently located just three blocks from town, is on the town's free bus route, and only 3 blocks from the Quicksilver Chair. This unit includes a one car garage and one additional outdoor parking space, no additional parking is available at Village Point. The condo was perfect for our group. 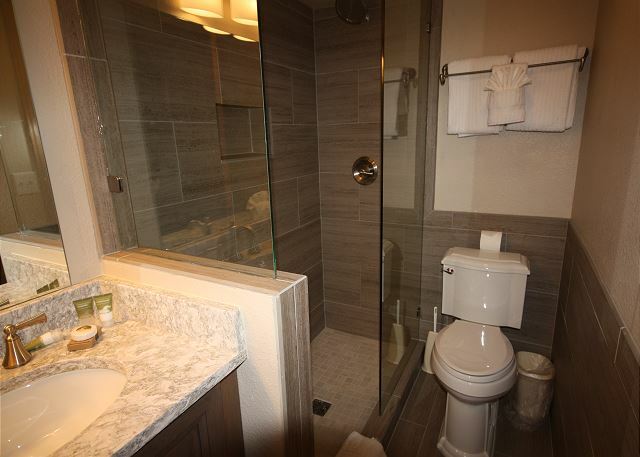 The condo is spacious and the layout, with 3 floors, two bedrooms downstairs, the master bedroom upstairs and living space between, provided privacy. The kitchen was fully equipped with plenty if pots and pans and utensils. Bring your own oil, spices, etc as there are none provided. It was also nice to have a hot tub on the deck. Newly renovated unit, very nice. The condo was very nice and clean, and exactly as described online. It was very comfortable and had all the amenities we needed! Thank you ! We loved having you as guests at Village Point 101 and Alpine Meadows. We are happy to receive a nice review of your recent stay and are so glad you enjoyed the home! 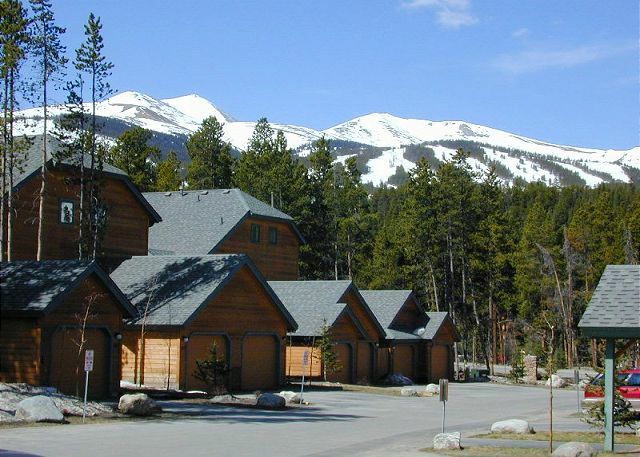 We hope we will get to host your next family trip to Breckenridge! We have rented the same Condo before. Each time we found it quite nice and taken care of. We had pretty much everything an apartment would need. Very spacious and quiet. 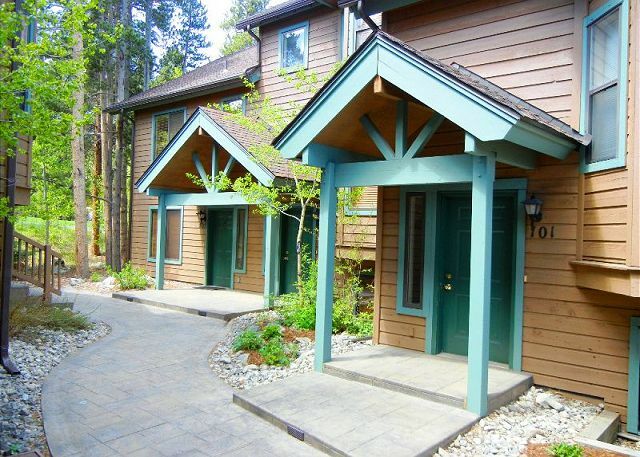 We are so happy that you enjoy making return visits to Village Point 101 and Alpine Meadows! Thank you for being a great guest & thank you for sending us a review of your stay with us, we are glad that you had a great time. This spot was absolutely perfect there were 6 of us and all had comfortable acommadations,Close to town and easily access roads to where we needed to go. 1st class linens sparkling clean , we would stay again. 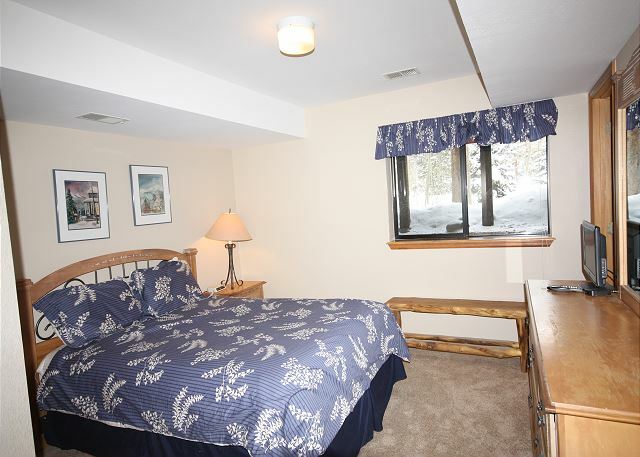 Thank you for choosing Alpine Meadows and Village Point 101 for your Breckenridge vacation! We are so happy to hear that you enjoyed your stay and all that the home has to offer! 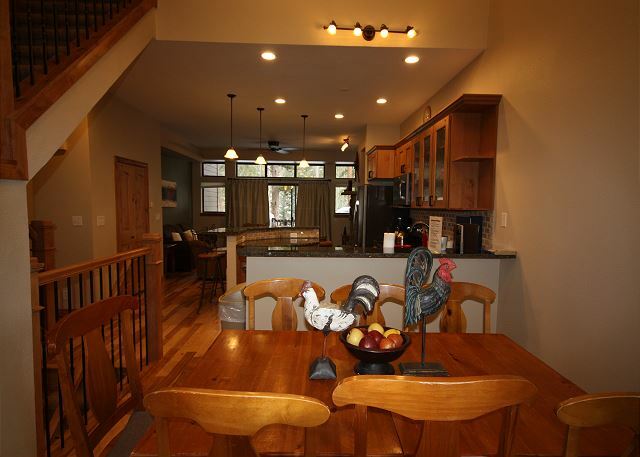 Recently renovated townhouse was beautiful with a great location for an easy walk to town. Bus stop to slopes was close by too. The only two issues were the noise from the road, which is right next to the place, was loud. It was only an issue in the master, but the street noise made it difficult to sleep. Also, the mattresses were old and quite uncomfortable in the master and the room with the twin beds. Thank you for sending a review of your recent stay at the Village Point 101 condo. We appreciate the feedback on the mattresses, recently replaced! We are glad you enjoyed the home as much as we do! We hope to see you again next time you are in Breckenridge. Very clean & comfortable condo. Well equipped kitchen. 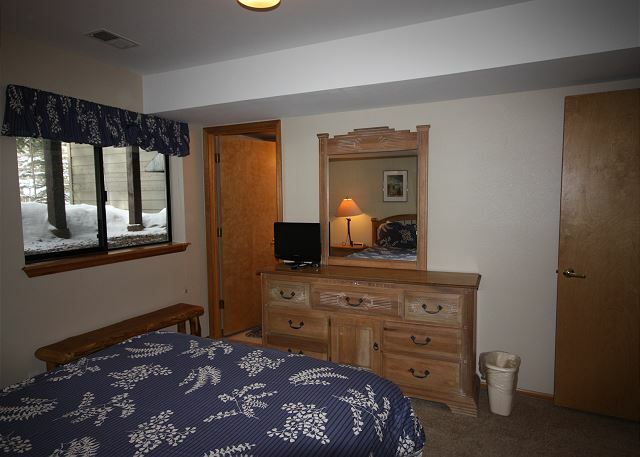 Comfortable bedrooms / nicely renovated bathrooms. Brown line bus pick up across the street made getting to/from the lifts quick & easy. Thank you so much for taking a moment to send us such a nice review of the home. We are happy that you enjoyed your stay! We hope to see you again for your next vacation to Breckenridge. We appreciate the review! Glad to hear you enjoyed your Breckenridge vacation! Overall a beautiful townhouse. Close to town. Very clean. We enjoyed our stay. One exception which brings our "star" quality down to a 3 is that the townhouse stated it sleeps 8. However, the fold out sofa bed was HORRIBLE! No one could sleep on it. When I told the rental company their response was that we could "rent" a rollaway bed! Unacceptible! This unit only sleeps 6....not 8. We really appreciate the feedback! Thank you for taking the time to send us your review. We since have had the had the homeowner purchase a new mattress for the sleeper sofa for all future guests. We don't have spare sleeper sofa mattresses on hand, we apologize for the uncomfortable inconvenience! We certainly hope to see you again next time especially now that there is a new mattress in place! 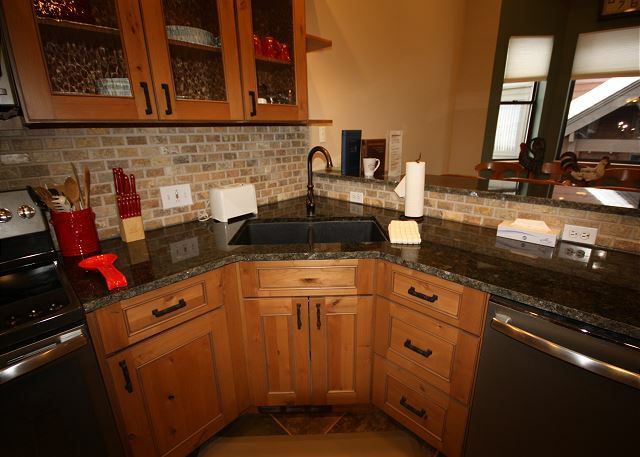 Thank you for choosing out home for your Breckenridge vacation! We are pleased to hear you enjoyed the home! We hope to see you again next time! Much nicer townhome than expected and a mere 5-minute walk to the lifts. Great place to stay. Thank you for the review on our Village Point 101 condo, we are pleased to hear you enjoyed your stay with us! Keep us in mind for your next Colorado Vacation! This is a very nice place, within comfortable walking distance of Peak 9 and to restaurants and shops (less than 1 mile). The front door lock is very difficult to open and lock and could use some attention. A few light bulbs out. Other than that, perfect. We have stayed at this place for the month of July for around ten years, does that say satisfied? Wonderful place, one of our favorites in Breck. Great layout and location. Would stay here again. Nice condo. Close enough to Peak Nine's lift to enjoy a quick walk. We would stay there again. ENJOYABLE IN A BEAUTIFUL HOME. Our rental was very nice, clean and convenient. Easy walk to town for dinner and shopping. It could use however a grill and deck furniture and some new bedroom pillow, but that was so minor. The management staff was so easy to work with and made sure anything we needed was taken care of ASAP!!! We would recommend this condo and management company. The Condo was wonderful and the location was great. The availability for help was good. Staff very friendly. 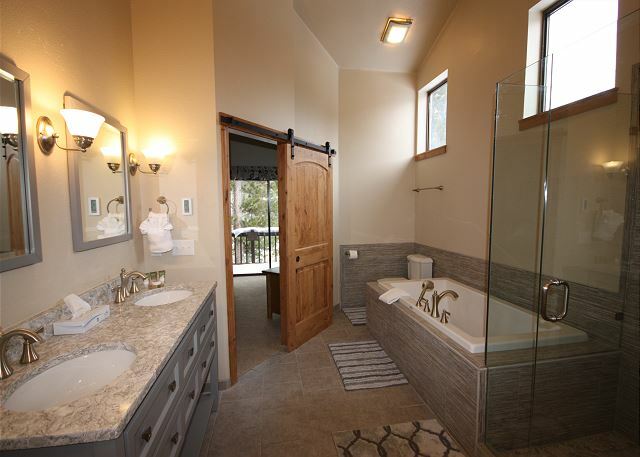 The only problem encountered was the water in the upstairs bathroom (Master Bedroom) was cold. There was hot water issues. The lower level was fine. Booking the unit was simple with a great staff. 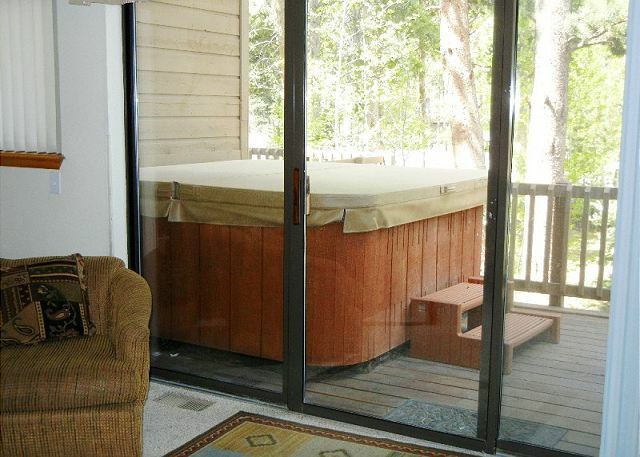 The unit was big, clean and had everything we needed, which included a hot tub on the deck. With a short walk to the lifts it was a wonderful long weekend stay. We had a lovely stay at Village Point. The place was clean, kitchen was well-stocked. THe only problem was that we were unable to immediately get ahold of someone to locate the power box (we blew a fuse). The next day, the staff could not have been friendlier and we definitely got well compensated for our problem. I will 100% book a rental with your company again in the future! 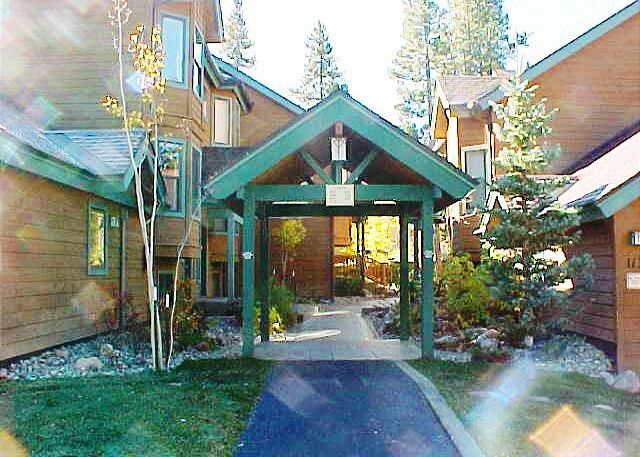 This was a great place for our family to stay - large enough for several families and in a great location for all of the Breckenridge summer fun. It was very clean and well managed. When cooking meals for a large group we found the kitchen was a little short of convenience items such as a vegetable peeler, large knives, and large skillet, but nothing we couldn't work around. Overall a great place! We have been using Alpine Meadows for a number of years and are pleased with their service. Village Point is a great location and more than adequate accommodation for the month we stay. Lost the use of the deck for three days for staining. Hot tub is loud and runs all the time.